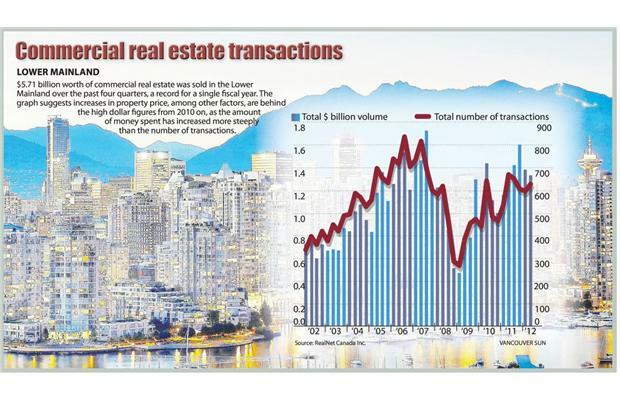 Commercial real estate sales across the Lower Mainland continued to climb, hitting a record $5.71 billion over the last fiscal year as property prices and sales rose, according to a new report. Of those, the majority was intended for housing development, which is counted as a commercial sale if no houses have yet been built. This suggests speculators think the residential slump will be shortlived, said George Carras, president of RealNet Canada, the real estate information services company behind Wednesday’s report. Canadian real estate investment trusts have rallied to the highest levels in five years as rising occupancy and investor demand for yield outweigh concern the Bank of Canada will raise interest rates to cool the market. The investors in properties from shopping centers and office buildings to rental apartments have benefited as the 10-year Canadian bond yield fell by more than half, boosting the value of their holdings. Are Fears of Imminent Drop in Canadian Housing Prices Overblown? 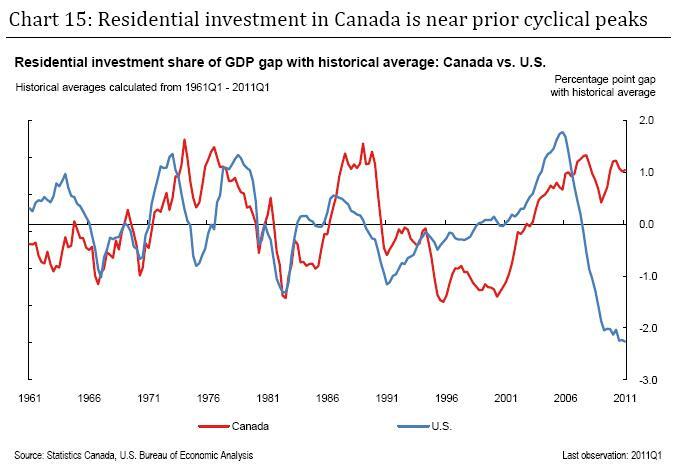 • For several months now, various analysts have expressed fears regarding the residential real estate sector in Canada based on ratios of house prices to income or rent. In our opinion, these analyses do not paint a correct picture of the situation in that interest rate levels were not taken into account. • The recent advance in house prices in Canada is due to recordlow interest rates at a time when the labour market has registered one of the best performances among the advanced countries since 2007. What’s more, Canada’s demographic profile is playing in favour of the housing sector given that the cohort of first-time homebuyers is presently growing at one of the fastest rates among the advanced countries. Leasing activity was strong across Canada’s office markets in 2011, with vacancy rates decreasing and rental rates trending upward in most markets nationwide. Canada’s overall office vacancy rate has declined steadily from 9.2% at the depths of the recession in 2009, to 8.3% in 2010, to 7.6% in the closing months of 2011 – solidifying the recovery. Benefitting from strong fundamentals, Canada’s commercial real estate markets continued to enjoy stability and growth in 2011 despite global economic uncertainty. Meanwhile, the United States suffered from ongoing uncertainty, with limited good news concentrated in a few select markets. Each country has its risks and concerns, but better days should be ahead for both as the world deals with its financial issues. – A home purchase triggers the biggest liability most families will ever take on. The value of housing-related debt in Canada has nearly tripled over the past decade to $1.3 trillion. This debt is also the single largest exposure for Canadian financial institutions, with real estate loans making up more than 40 per cent of the assets of Canadian banks, up from about 30 per cent a decade ago. The Vancouver real estate market has been the subject of much debate in recent years, but what’s not in dispute is that homes in this west coast city are dramatically over-priced. While Canadian house prices have more than doubled in the last decade, Vancouver’s have more than tripled. Consider that the average national house price of $373,000 is 5.1 times the annual median family income, while the average Vancouver house price of $815,000 is 11.2 times median family income, according to BMO Capital Markets’ report A Tale of Three Canadian Housing Markets, published June 7. That means the average house price in Vancouver is 71% more than the average in Toronto. This growing unaffordability has made Vancouver the third least affordable city in the world, according to a Demographia survey, which looked at 325 markets across the globe. You are currently browsing the archives for the Commercial -Vancouver BC category.